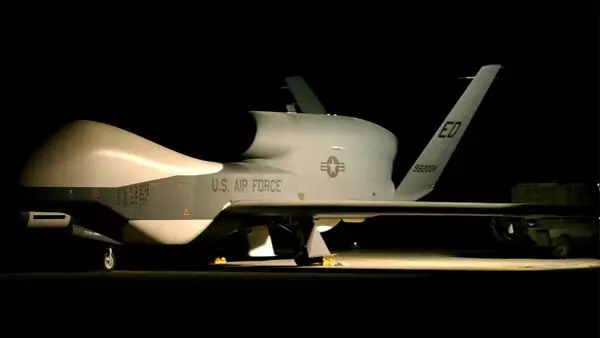 Global Hawk reconnaissance aircraft pictured at a forward deployed location (Courtesy Reuters). U.S. counterterrorism strategy in Pakistan in the years after 9/11 focused primarily on law enforcement and intelligence exploitation through arrest and interrogation—including torture—of suspected terrorists. According to the State Department’s report, Patterns of Global Terrorism: 2002, "The government of Pakistan arrested and transferred to U.S. custody nearly 500 suspected al-Qaeda and Taliban terrorists." By 2004, however, the United States essentially stopped detaining suspected terrorist operatives in Pakistan, and instead began targeting and killing them with armed drones. The CIA is the lead executive authority for drone strikes in Pakistan. As such, the missions are classified as "covert actions," which Title 50 of U.S. Code defines as "activity or activities of the United States Government to influence political, economic, or military conditions abroad, where it is intended that the role of the United States Government will not be apparent or acknowledged publicly." In one sentence, President Obama revealed what had previously been one of the most highly-classified programs in the U.S. government. Under his own December 2009 Executive Order, the president has the legal authority to declassify anything he chooses. However, the manner in which the president explained and defended such a secretive and controversial program did little to allay concerns, and only raised more questions that his administration should now be able to answer publicly. President Obama often counters criticisms of his administration’s policies by constructing straw men of opposing arguments and then dismissing them as "silly." In response to Evan’s question on drones, the president said, “There’s this perception that we’re just sending a whole bunch of strikes willy-nilly.” Instead, he noted that "this thing is kept on a very tight leash," and not managed by "a bunch of folks in a room somewhere just making decisions." If targeting decisions are not made by “folks in a room,” how are they made? I’ve previously estimated that there are between five and seven separate “kill lists” of suspected terrorists and militants who could be targeted by drones or special operations forces. Who decides how someone is added or removed from these lists? What efforts, if any, are made to capture and interrogate the targets, instead of killing them? President Obama said that drones are used against "al-Qaeda operatives" engaged in "active plots against the United States." We know from reporting by Pakistani journalists that the vast majority of suspected militants targeted are not members of al-Qaeda, nor are they involved in plots against the U.S. homeland. Many of the targets are actually anonymous, low-level militants who provide operational support to the Taliban insurgency in southern Afghanistan. As the United States moves forward with negotiations with the Taliban toward an Afghan political solution, will the president continue to target Taliban insurgents with drones in the Pakistani safe haven? Finally, President Obama stated that “drones have not caused a huge number of civilian casualties,” which raises numerous red flags. How would the president define a “huge number?” How many civilians does he think have been killed by drone strikes? In December 2005, President Bush (probably underestimating the actual amount) approximated that "30,000 Iraqis, more or less, have died as a result of the initial incursion and the ongoing violence against Iraqis." Gen. George Casey added, "I’ve not seen a number higher than 50,000." In Pakistan, estimates vary widely, ranging from 2.5 percent of all people killed to between 17 and 26 percent. Now that the president has finally acknowledged the existence of the CIA drone program in Pakistan (although not yet the use of CIA drones in Yemen), there should be an open and honest debate. Drone strikes are a low-cost, highly responsive, impressive, and effective military tool. Yet there are numerous unanswered questions that remain despite the president’s overdue comments. It is now the responsibility of the American public, Congress, and the media to press the Obama administration for answers. To watch the Google+ "Hang Out," see below.